A recording of the March 2018 Webinar. Initiated under the 2017 tax bill, the provision gave governors of every U.S. state and territory 120 days to nominate up to 25 percent of low-income census tracts within their jurisdiction as Opportunity Zones. Low-income census tracts have a poverty rate of at least 20 percent and a median family income less than at a certain threshold determined by geography. Governors could also nominate certain areas contiguous to eligible census tracts, but only 5 percent of nominations may fit this qualification. Opportunity Zones will receive investments from Opportunity Funds for 10 years. Investing in Opportunity Funds comes with attractive benefits: investors can defer taxes by reinvesting capital gains in Opportunity Funds and, depending on the length of the investment, can accrue additional capital gains tax incentives. In terms of the number of Opportunity Funds that may be started, the provision is silent, providing impact investors an opportunity for developing such funds as long as they meet the criteria of investing 90% of assets into Opportunity Zones. A tool by Enterprise that shows eligible tracts and final tract selection for each state. In terms of eligible investments, the USIIA forecasts plenty of diversity in investment opportunities, which can take the forms of high-growth startups, entrepreneurship incubators, affordable housing, and more. Since the guidelines for Opportunity Funds are broad on the federal level, there is also an opportunity for states to layer on additional incentives to align impact with local needs. Enterprise Community Partners has created a set of tools to take advantage of this possibility for creativity in structuring Opportunity Funds. The Investing in Opportunity Act is not the first effort of its kind to steer investments towards low-income communities. Under the Clinton administration, the Empowerment Zones program designated “Empowerment Zones” in 6 cities that were eligible for various development benefits. Opportunity Zones, however, are not limited to 6 cities and thus much broader in scope than Empowerment Zones. Additionally, the Empowerment Zones program has been criticized for subsidizing businesses, which resulted in existing businesses moving into eligible areas but not creating new jobs. The Investing in Opportunity Act subsidizes investors instead, which aims to attract investor capital to existing businesses in low-income areas or to start new businesses there. This draws comparison to the New Markets Tax Credit (NMTC) program, which incentivized investors for investing in eligible entities supporting low-income communities. As the webinar presenters pointed out, the current provision is a benefit rather than a program, unlike existing initiatives: programs like Empowerment Zones and NMTC are subject to extensive federal oversight, while much less is expected to cover Opportunity Zones, offering non-profits and other impact-driven entities considerable latitude in value creation. More capital for the sake of more capital isn’t always necessarily a good thing: the selection process and broad Zone criteria retain the potential for abuse. Policymakers may be allowed to cherry pick areas: the Governor of South Carolina recently submitted a list of 135 eligible census tracts, but U.S. Rep. Jim Clyburn, South Carolina’s lone Democrat in Congress, expressed concerns about politicians “cherry-picking” areas to nominate. California is an illustrative example of just that: several of the state’s Opportunity Zones were selected around Palo Alto because of its high population of “low-income” students - possibly to funnel capital to tech startups. After a short but heavily participated-in public comment period, California announced significant revisions to their initial proposed nominations. Some also suspect that investors will use the provision as a loophole for tax evasion. Some investors may be purely motivated by the tax benefits, choosing a “return-first” approach rather than impact-first. A likely target is the real estate market given the maximum benefits for longer-term investments. This makes gentrification another probable externality, particularly if the distribution of capital favors zones with high growth potential. A mechanism of gentrification important to look out for is the adjacency to already gentrified/gentrifying neighborhoods; investments in Opportunity Zones next door may expedite the process and expand the effects. 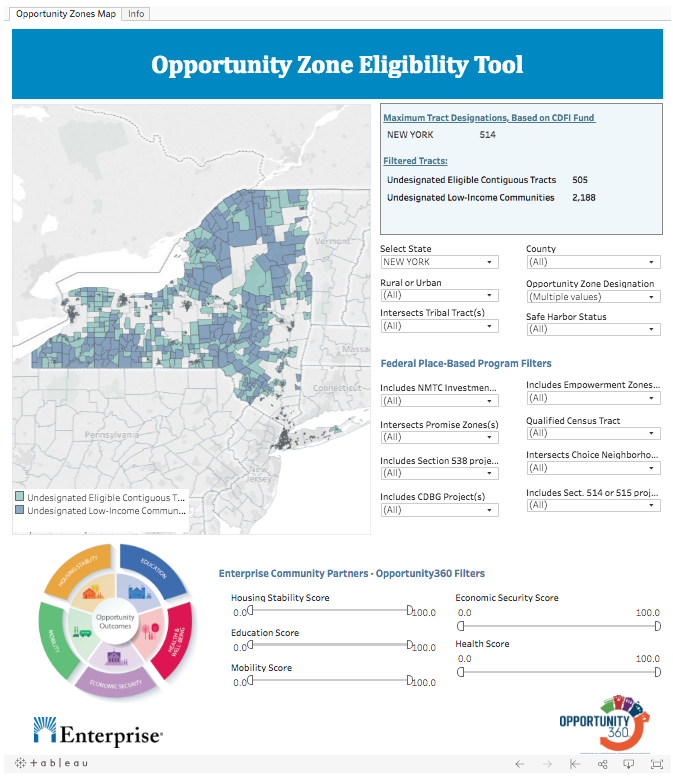 In fact, one study of the similar Empowerment Zones program found that areas adjacent to selected zones suffered due to channeling investments solely to the designated zone. After the first round of Opportunity Zones submissions from states, Brookings found that “22 percent of selections were for areas with relatively low poverty rates (below 20 percent) and an additional 19 percent were in already-gentrifying areas (areas with the highest rates of home price appreciation).” However, the same analysis did highlight that the majority of the Zones were in the most distressed areas for most states. Another inherent limitation is the 10-year perishability of Opportunity Zones, as investors failing to move capital into Opportunity Funds at the start of the period aren’t guaranteed to reap the tax benefits if the bill changes or isn’t renewed. Within this time frame, as the benefits of the bill accrue from deferring capital gains, financial instruments available for Opportunity Zones are limited in their ability to take on alternative forms of financing such as mezzanine debt. The primary question is: will investments actually create long-lasting value for the intended communities? As the webinar speakers discuss, the 10-year lifespan of the bill means that best practices will be set in the next few years as investors act early to reap the full tax benefits of the program. It is imperative that the first movers avoid the pitfalls of the bill to set a precedent for the coming influx of capital in the designated tracts. As with any new pathway for capital allocation, it is imperative that investments under the new bill are undertaken with the express involvement of community stakeholders and the end result is one that mitigates unintended consequences such as gentrification. To watch this webinar and other select recordings, please visit http://transformfinance.org/investor-resources/. If you’re interested in Opportunity Zones or the Transform Finance Investor Network, please reach out at info@transformfinance.org. This blog post was updated on May 18, 2018 to reflect some of the new analysis on the final designations of Opportunity Zones.